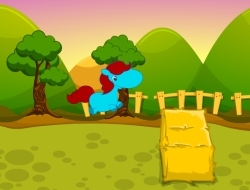 This fun pony game will really make you love this miniature horses a lot more. They are so cute with their small legs and every kid loves them. This is a racing game so you will have to run with the poney as fast as you can, but beware as there will be some hurdles and haystacks. You will have to jump over them, and dont be afraid as the ponies can almost fly, especially since you can collect some power-ups. Some will give you a higher speed, others will make the next collision be ignored so you will not lose any speed. Choose one of the three ponies and see which one you like the most around the tricky track. Use the mouse to jump and control the speed of your pony. Pony Races 10.00 between 0 and 10 based on 1 votes.